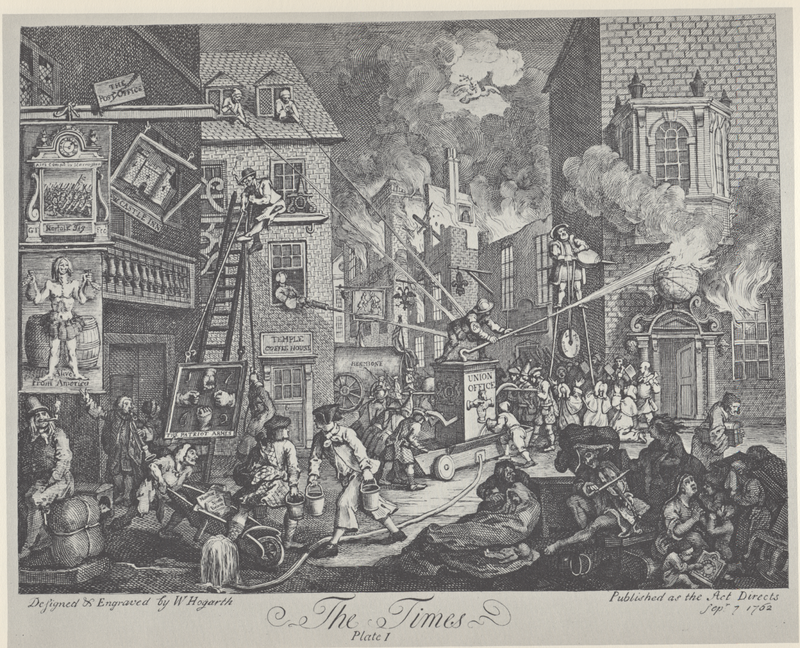 The Times, Plate 1, William Hogarth, 1762, Wikimedia Commons. Hogarth did not shy from political messages in his prints. In this piece, he takes the side of the King in ending the Seven Years/French and Indian War. A metaphorical conflagration consumes houses of the Spanish, French, and Germans, and threatens the as yet standing British house. Standing on stilts is the figure of Henry VIII (in later versions Pitt), fanning the flames with a bellows. In the streets below, soldiers of the highland regiments, regulars, and grenadiers work the pumps of a fire engine bearing symbols of the King to extinguish the blaze. The soldiers are not alone in their efforts. 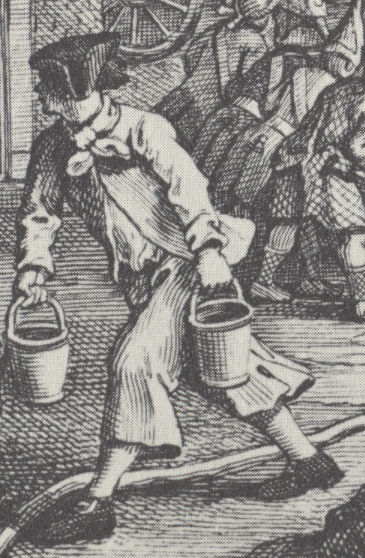 A highland Scot and a sailor carry buckets of the much needed water. The firefighting tarpawlin wears a backward turned cocked hat, a short jacket without buttons or cuffs, trousers with wide legs ending about the mid calf, no waistcoat, and a white neckcloth tied in a broad knot at the neck. I don't understand the term "The firefighting tarpawlin", as a tarpaulin in the 18th century was a canvas. Was the term duel purposed? "Tarpawlin" is indeed dual purposed, at least in the eighteenth century.